This article is about Battlefield in Super Smash Bros. Ultimate. For similar stages, see Battlefield (disambiguation). Battlefield (戦場, Battlefield) is a stage in Super Smash Bros. Ultimate. It was the very first stage revealed for Ultimate during the Nintendo Direct of E3 2018. Ryu is fought here for his unlocking battle. Like its predecessors, Battlefield consists of a central, solid platform, with ledges at its sides that can be grabbed. Above this platform, there are three more soft platforms, arranged in a triangular layout. As in Super Smash Bros. Brawl and Super Smash Bros. 4, the background shifts between light and dark. However, in this iteration, this is due to a regularly-occurring solar eclipse rather than a day/night cycle. In Ultimate, the Battlefield seems to combine some of the visual aesthetics from the two previous Battlefields (three if you count the 3DS and Wii U versions of Battlefield as separate). Once again, the stage is made mostly of rock, with bushes and shrubs growing on the side. Behind the main fighting area, there is a half crumbled arch to the left, and ice shards to the right. On the underside, there is a giant, jagged piece of ice at the bottom, surrounded by rock. The ice does not collide with anything, making Battlefield completely symmetrical. Ruins are present in the background, similar to the Wii U version of the stage, but there are now waterfalls where empty sky used to be. 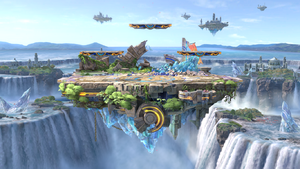 In the distance, a slightly torn flag with the Super Smash Bros. series logo on it waves, similar to Smash for Wii U.
Battlefield's Ω form is identical to the regular stage, but with the soft platforms removed. Unlike Battlefield's Ω form in Smash 4, which was lengthened, this stage is the same length as the normal Battlefield, as Final Destination is now the same length as Battlefield. Battlefield itself can be selected as a Battlefield form, but doing so is identical to selecting the normal form. Captain Falcon on the stage. Greninja jumping from the stage. Kirby throwing a Fireball, copied from Mario. A Female Pikachu taunting with the Female Pokémon Trainer. Pit using his Guardian Orbitars. Ridley using his down special on Fox. An 8-Player Smash between Inkling, Kirby, Link, Mario, Marth, Pit, Ridley, and Villager on the stage. In the E3 2018 demo build of Ultimate, selecting Final Destination would load the Ω form of Battlefield instead. Ultimate's version of Final Destination had not been revealed at the time. Also, in the E3 2018 demo build, a demo version of the "Battlefield" theme was heard. The Battlefield stages from the previous games can be seen floating in the background. This page was last edited on April 17, 2019, at 02:44.